Sony has officially rolled out Xperia T LT30p Jelly Bean 9.1.A.1.141 firmware update over the previous version 9.1.A.1.1400 which means it is just a minor bug fixing update for the users. 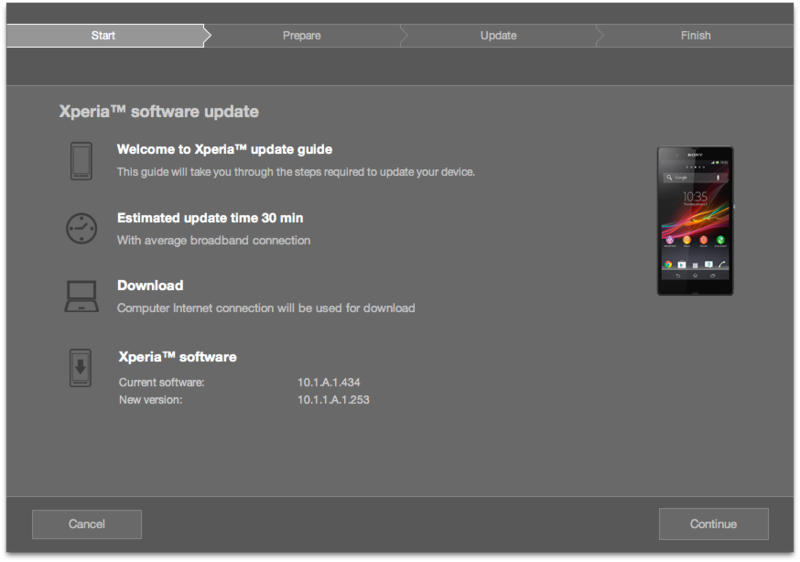 Yesterday we saw Xperia TX LT29i got the Jelly Bean 9.1.B.1.67 firmware update which was a major bug fixing update from Sony. Now lets update the Xperia T LT30p on Jelly Bean 9.1.A.1.141 firmware. The update is available via both PC Companion as well as via SUS. Connect your phone to PC. Open PC Companion. If you have got the notification on your Xperia T for Jelly Bean 9.1.A.1.141 firmware update then proceed with the on-screen instructions. Notification will look like below screen. After you have updated, the first reboot will be slow, take care of that. Now if you have not got the official notification in your region, then you can also manually install the Xperia T LT30p Jelly Bean 9.1.A.1.141 firmware update by flashing the ftf file on your unlocked bootloader. 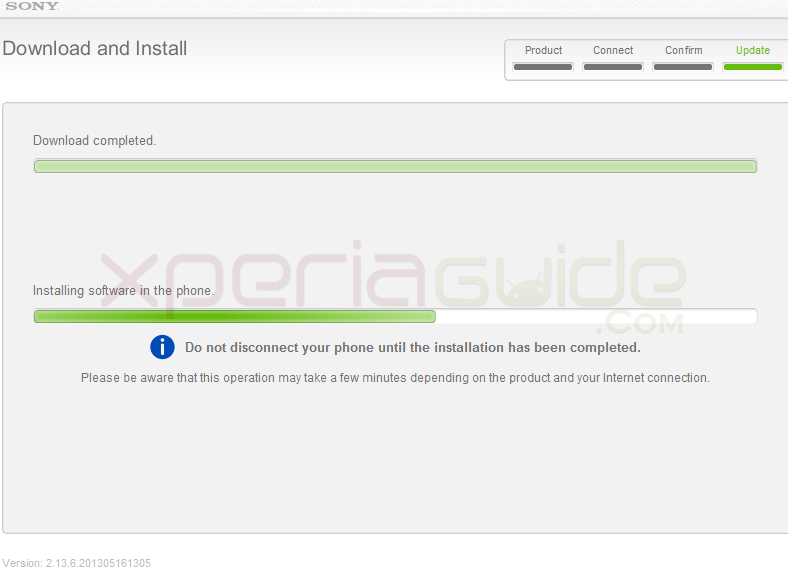 How to update manually Xperia T LT30p by flashing Jelly Bean 9.1.A.1.141 firmware ftf file via Xperia Flash Tool ? If you don’t have unlocked bootloader on your Xperia T, get it done as it is necessary to flash the given below ftf file. After you have downloaded the above file please flash it on your Xperia T LT30p only. If you don’t know how to flash it then please refer to our guide given below. Jelly Bean 9.1.A.1.141 firmware update seems to be a minor bug fixing update only so any exact change log is missing, if you have updated your Xperia T LT30p then do let us know in comment section regarding the change log and any bugs if found. A news of relief for Xperia Ion HSPA Lt28h users that new Jelly Bean 6.2.B.0.211 firmware has been certified by PTCRB on June after they previously certified 6.2.B.0.204 firmware. 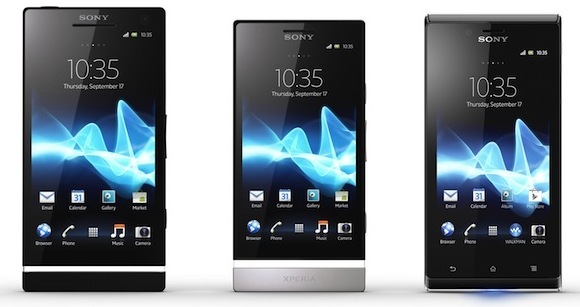 Sony recently rolled out Jelly Bean 6.2.B.0.204 firmware for Xperia S LT26i, Xperia SL LT26ii and Xperia Acro S LT26w but soon many users have reported some serious bugs in the firmware. 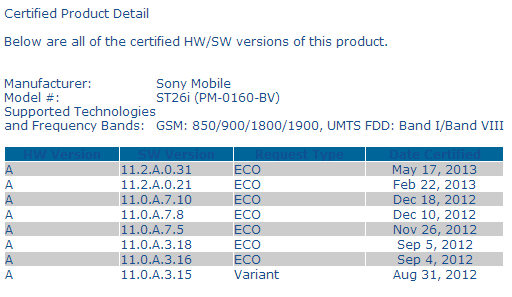 So Sony decided to update the firmware for Xperia S, SL and Acro S as 6.2.B.0.211 which will be rolled out in the 23-24 week of 2013. 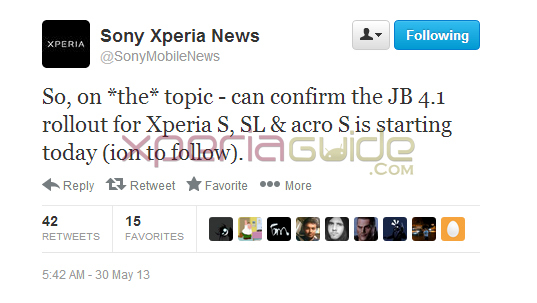 On 30 May, Sony Xperia News Tweeted that Jelly Bean for Xperia Ion will follow as soon as Jelly Bean for Xperia S, SL and Acro S is rolled out, it has been rolled out but still Xperia Ion users didn’t see any Jelly Bean firmware rolling out. 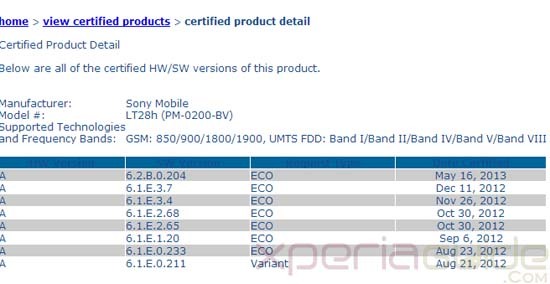 It seems that Sony planned to launch the same Jelly Bean 6.2.B.0.211 firmware for Xperia Ion also but when so many Xperia S users reported bugs in it, they may have delayed its rolling date to get a better update in the form of Jelly Bean 6.2.B.0.211 firmware. 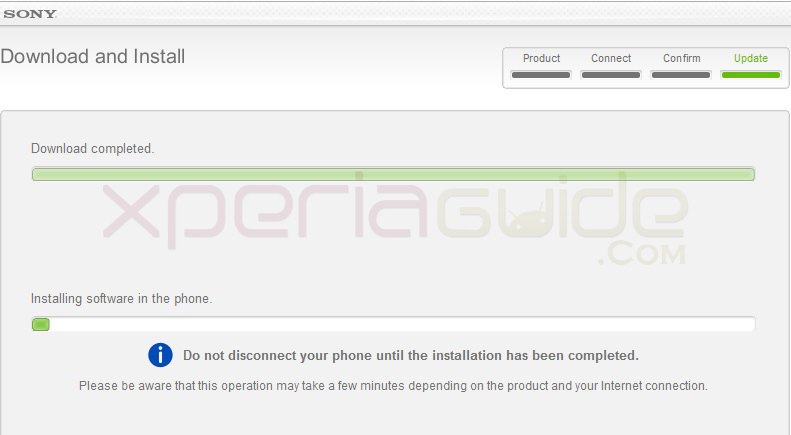 Let’s hope we soon see Xperia Ion LT28h on Jelly Bean 6.2.B.0.211 firmware update. Something is definitely cooking up, Sony Mobile Communications is hosting a press event on 25 June at Munich, Germany. For what it is for ? That’s the mystery remain unsolved yet. 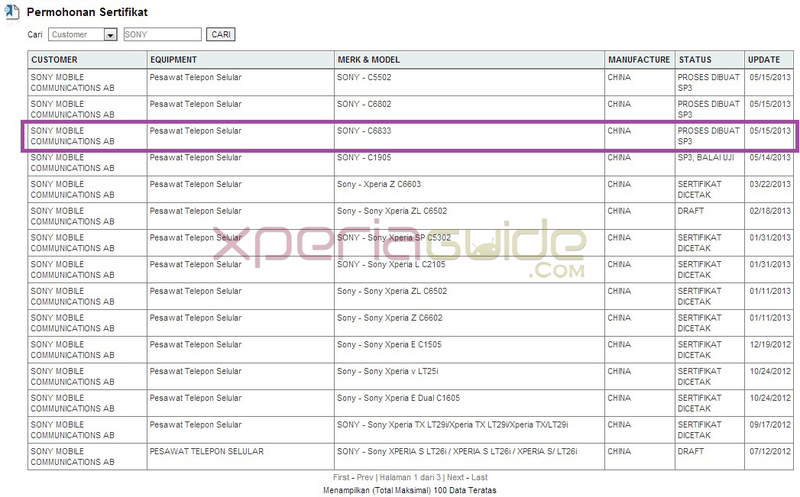 Rumors are that Sony is about to launch its first phablet code named as Sony Togari which we have seen number of times in leak images online, as Xperia ZU very soon. Press invitations for meet on 25 June has been started by Sony. The above banner read as “LUST AUF MEHR?” whose English translation is as “Desire for more?”. More translation are as follow “Es wird Zeit für den nächsten Schritt. Am Dienstag, den 25 Juni 2013 ab 15 Uhr werfen wir gemeinsam einen ersten blick in die Zukunft” as “It is time for the next step. On Tuesday, June 25, 2013 from 15 clock we throw together a first look into the future”. 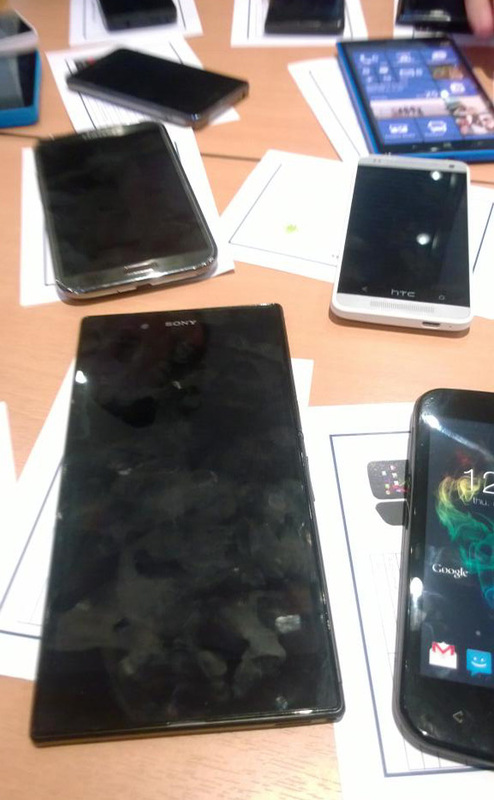 It is expected that Sony might be launching a new android device on this press meet. There are many speculations behind this, people are claiming that Sony might launch a new Xperia device range for 2013, a Google Nexus edition of Xperia Z or can be the launch of their first cyber shot phablet Togari. It can also be a launch of Sony Xperia Honami which has already been listed by “Snapdragon Wikipidea Page“. 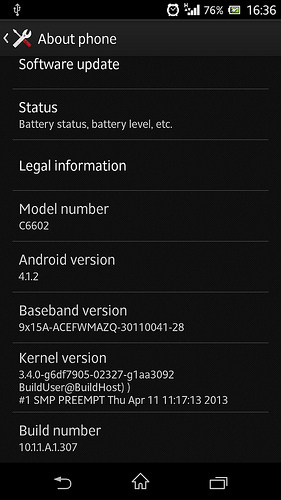 Xperia TX LT29i has got a Jelly Bean 9.1.B.1.67 firmware update officially. Sony listed on their site about Jelly Bean 9.1.B.1.67 firmware update release date as 2013-06-05. Jelly Bean 9.1.B.1.67 firmware update is available via both PC Companion as well as via SUS. Users in Hong Kong and Taiwan have reported this new update. 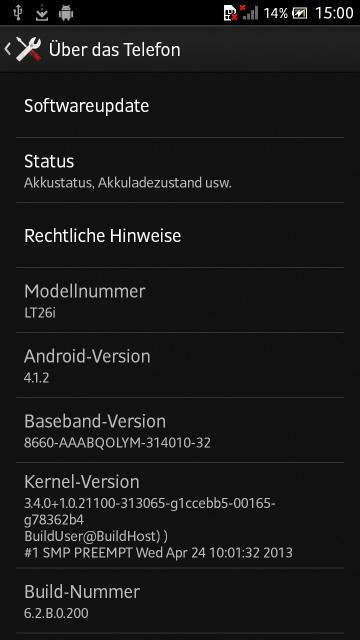 Improvements with the kernel and baseband version are seen. Now let’s update Xperia TX LT29i on Jelly Bean 9.1.B.1.67 firmware. 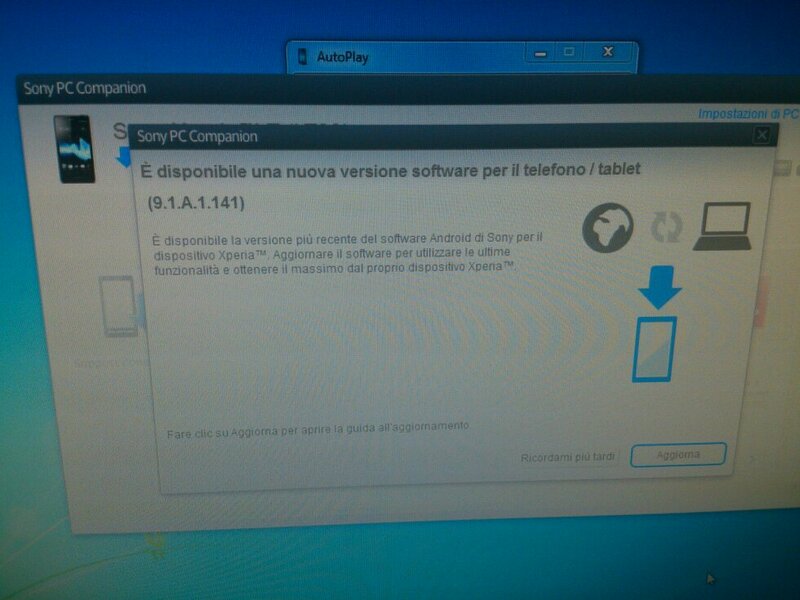 Connect your Xperia TX LT29i to PC, open PC Companion, you must see a notification like below depending on your region. Proceed with the Jelly Bean 9.1.B.1.67 firmware update as per on-screen instructions shown. Note : – After the update, first boot is always very slowly, after that it will be fine. 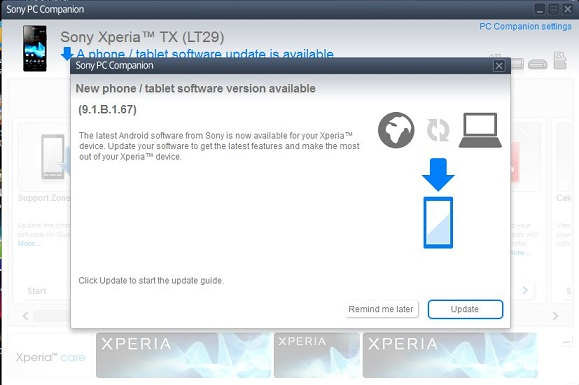 Well if you haven’t got notification for Jelly Bean 9.1.B.1.67 firmware update yet then you can also update your Xperia TX LT29i by flashing the ftf file via Xperia Flash tool. 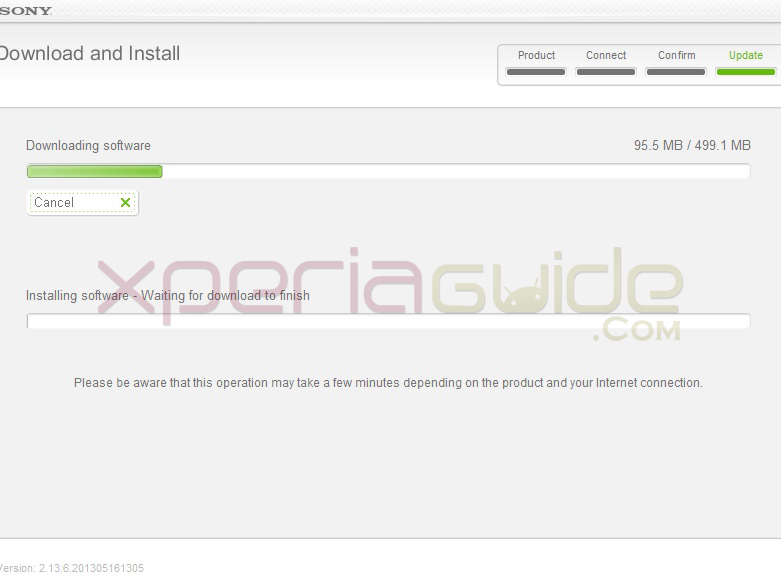 How to update manually Xperia TX LT29i by flashing Jelly Bean 9.1.B.1.67 firmware ftf file via Xperia Flash Tool ? First of all download the ftf file from given below links. Flash the above file on your unlocked bootloader Xperia TX LT29i and enjoy the new Jelly Bean 9.1.B.1.67 firmware 🙂 Check below link how to flash Jelly Bean 9.1.B.1.67 firmware ftf file on Xperia TX LT29i. Root is removed after flashing the 9.1.B.1.67 ftf file. Users have reported that the update has fixed problems like facelock, improved 3D rendering and transition animations. Battery life has improved a lot. 1% drop was seen overnight. No lag and UI is very smooth. 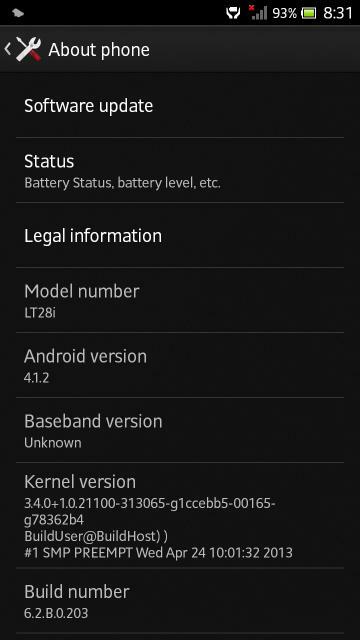 Xperia TX LT29i Jelly Bean 9.1.B.1.67 firmware exact change log is still unknown, if you have updated your Xperia TX then do let us know in comment section if any change you noticed. Sony has officially rolled out Xperia L C2105 Jelly Bean 15.0.A.1.36 firmware update with release date listed on their site as 2013-06-04. Jelly Bean 15.0.A.1.36 firmware was certified by PTCRB on 16 May. Till now Vodafone Xperia L users have reported this Jelly Bean 15.0.A.1.36 firmware update as Vodafone officially listed the news of rolling Jelly Bean 15.0.A.1.36 firmware update for Xperia L. It is still not known that is the update rolled for free versions or of any operator. Jelly Bean 15.0.A.1.36 firmware update is available via both PC Companion as well as via SUS. For RUSSIAN Users of Xperia L, they can download the ftf file from below link. For Users from UKRAINE , they can download the ftf posted below. You can see the flashing steps from given below link. Flashing guide for installing manually Xperia L C2105 Jelly Bean 15.0.A.1.36 firmware ftf file. Improved stability and performance is expected in the Jelly Bean 15.0.A.1.36 firmware. Internal phone memory detection had a slight problem is previous Jelly Bean 15.0.A.1.31 firmware, this is issue is expected to be resolved in this update. The exact change log of Xperia L C2105 Jelly Bean 15.0.A.1.36 firmware update is still unknown, if you have got the update on your Xperia L, do let us know the change log in the comment section. 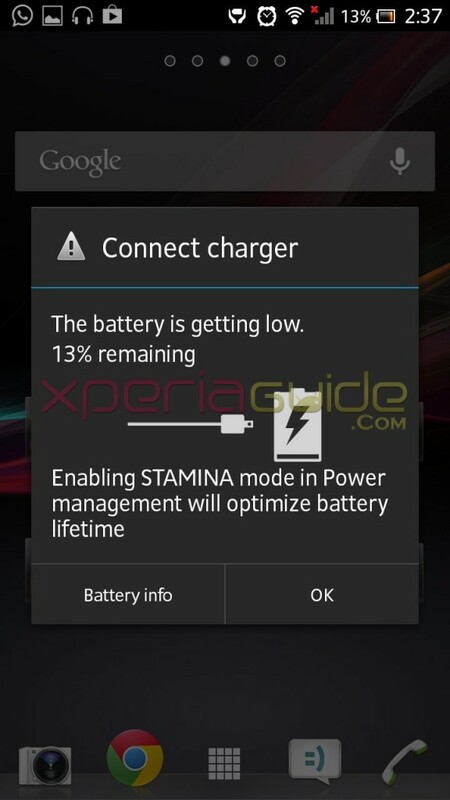 Stamina Mode have you heard of it 😛 Surely every Xperia user must have, Xperia Z and Xperia ZL saw for the first time this battery extending app “Stamina Mode” in the phone. Stamina Mode app or I say feature is a great one if you don’t want to install any third party battery saving apps. 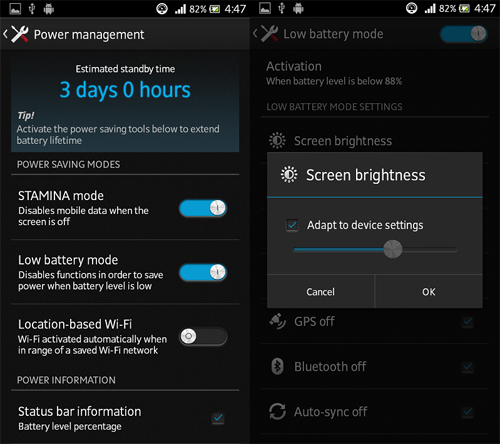 How to Port Xperia Z Stamina Mode to Xperia S, SL, Acros S, Ion ? 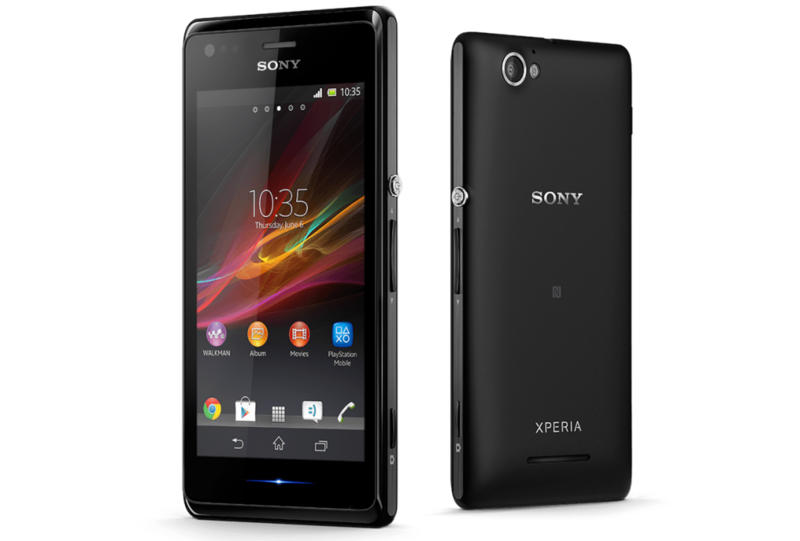 Let’s see how you can port Xperia Z Stamina Mode to Xperia S, SL, Acro S, Ion i.e. 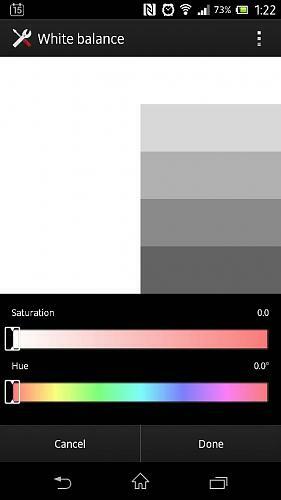 on Xperia 2012 handsets. We have 2 methods of porting. Xperia S, SL, Acro S, Ion must have Rooted Jelly Bean firmware. Works for both locked as well as unlocked bootloader. To unlock bootloader refer to this official Sony unlocking bootloader guide. After downloading the stamina mode zip file, unzip and copy it to your phone then, it has 3 folders “app, bin, framework”. 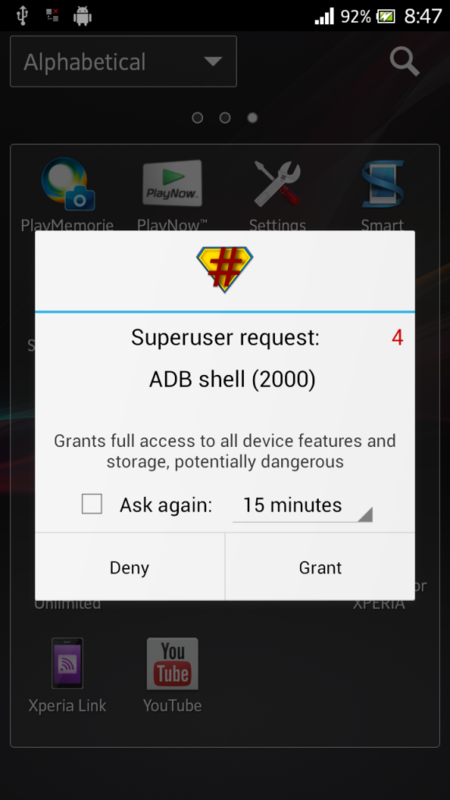 App folder contains 3 apk files as “SemcPowerSaveModule.apk , Settings.apk, SuperStamina.apk”. Do change the permission while moving below 3 files. Now move the folder “app” to “system/app”. Now move the file “bin” to “system/bin”. Change permissions to “Rwxr-xr-x”. Now move file “framework.jar” to “system/framework”. All done, reboot your device now 🙂 If it didn’t work for you, try checking the method 2 below. 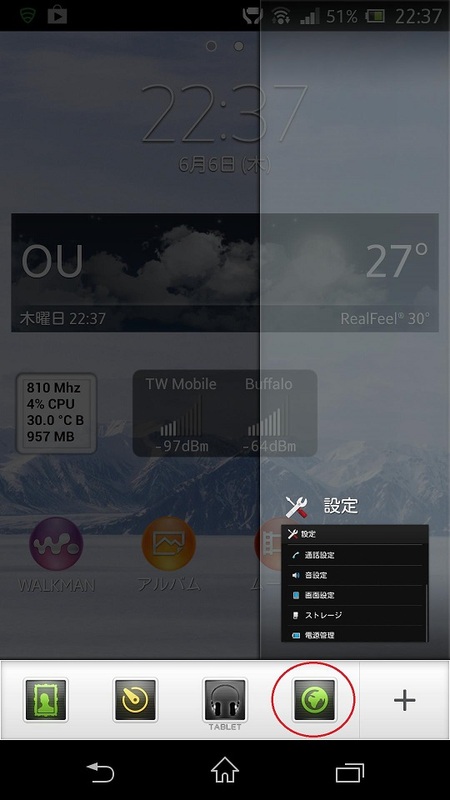 New UI on Xperia S after porting looks great. Do let us know if the Stamina Mode worked on your Xperia S, SL, Acro S, Ion or not. Leave comments in case you need any help regarding porting or installing. Do mention any bugs if you come across any. Good news for all Xperia J users, the phone has been updated to new Jelly Bean 11.2.A.0.31 firmware officially. 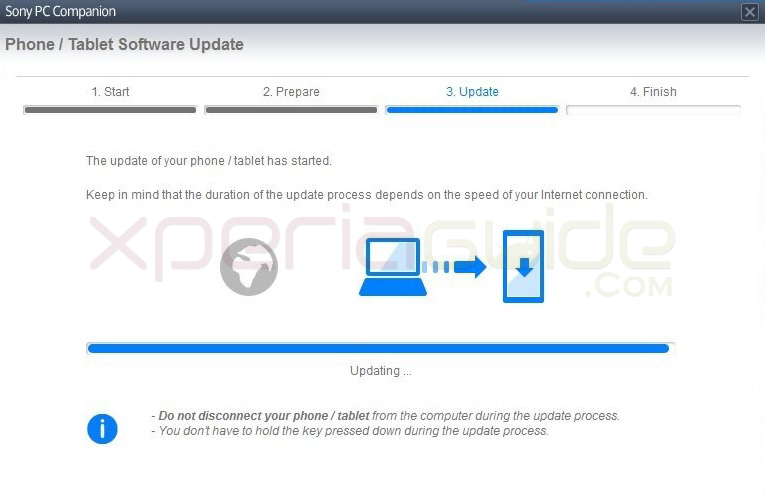 Previously on March 7, Xperia J got for the first time the Android 4.1.2 Jelly Bean 11.2.A.0.21 firmware update and now another firmware has been released to fix all the bugs which were present in the previous update. We just got the notification for Jelly Bean 11.2.A.0.31 firmware update in INDIA region. 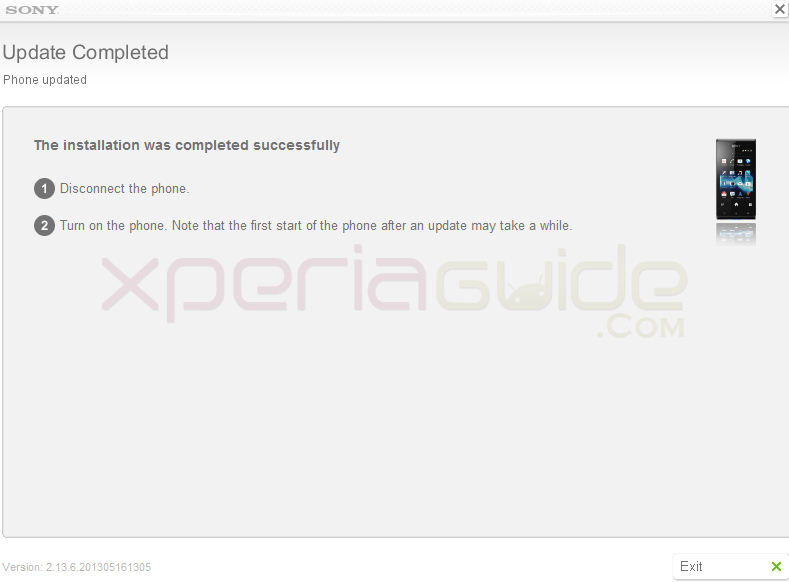 [ UPDATE ] – 6 Sept.
Xperia J ST26i 11.2.A.0.33 firmware Rolled Out – Minor Update Only. No new changes are seen in the update. It’s the same update as before but a little bit more smooth now 🙂 Much better multi-tasking now 😛 Antutu benchmark results are 4464 which are better than previous. 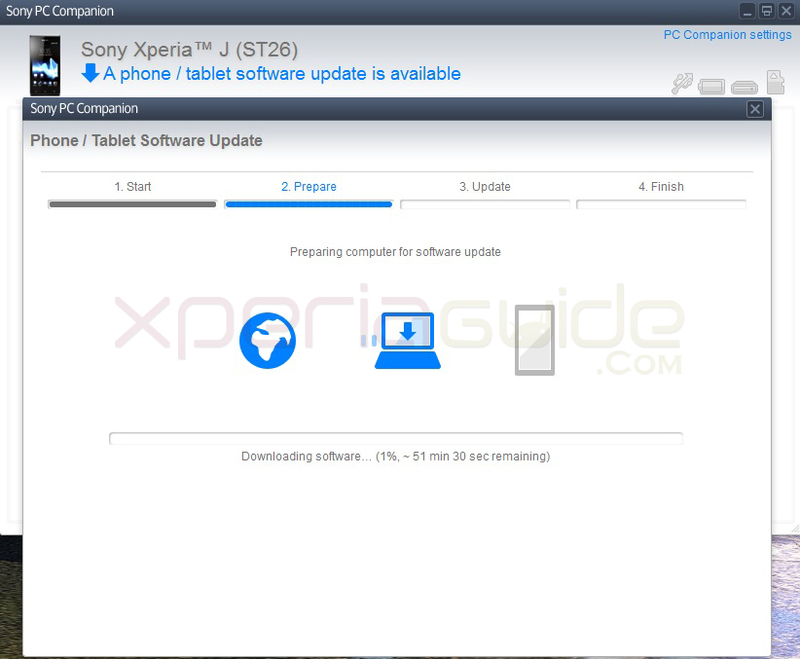 How to Update Xperia J ST26i to Android 4.1.2 Jelly Bean 11.2.A.0.31 firmware ? 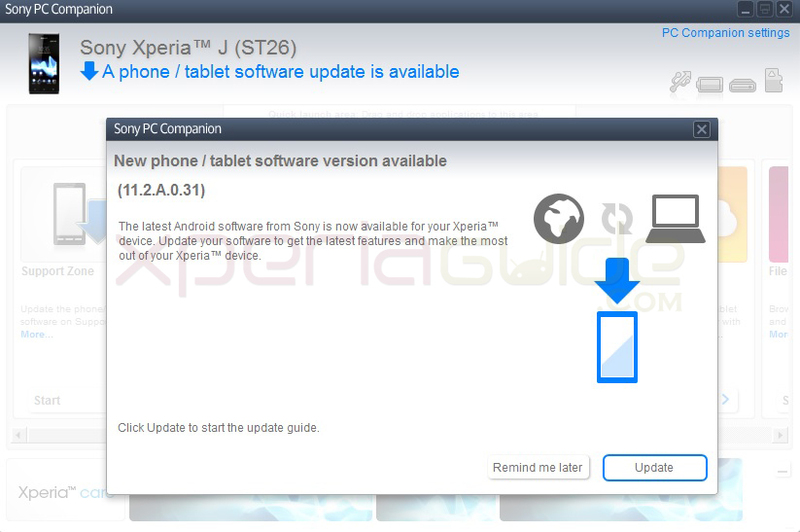 The Xperia J ST26i Jelly Bean 11.2.A.0.31 firmware update is available by both PC Companion as well as by Sony Update Service. 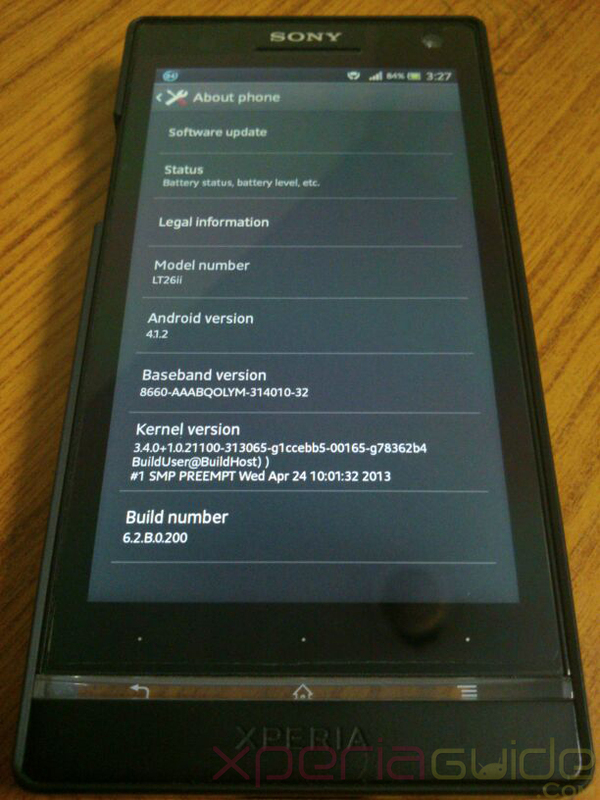 Let’s see how to get this Xperia J ST26i Jelly Bean 11.2.A.0.31 firmware update on your phone. 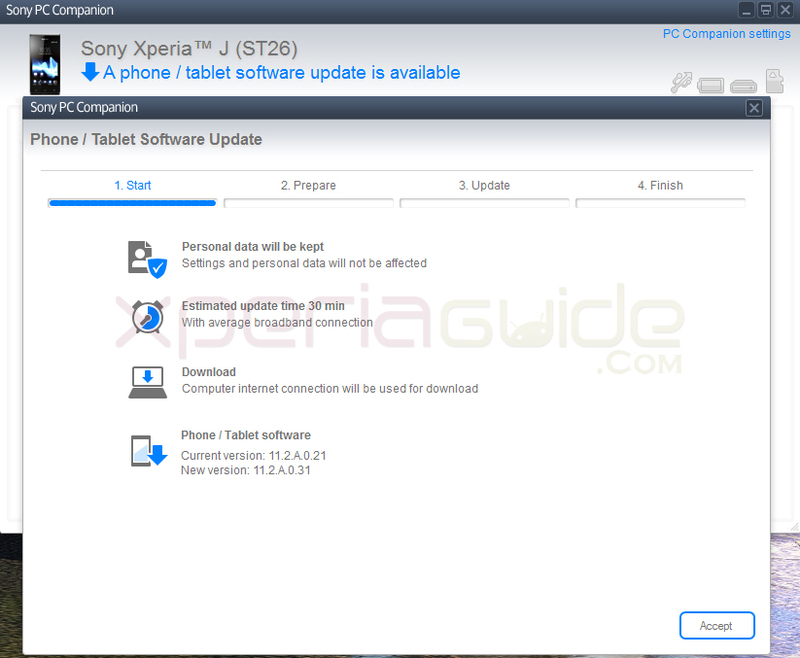 How to Update Xperia J ST26i on Jelly Bean 11.2.A.0.31 firmware by PC Companion ? Back up data on your Xperia J ST26i for safety. 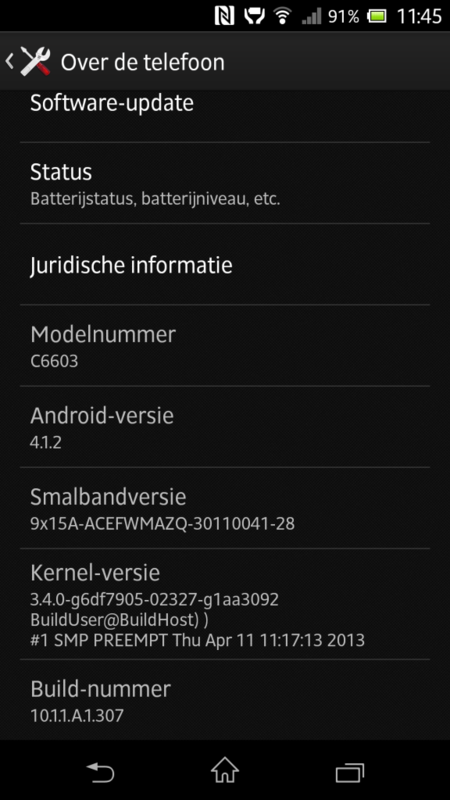 1 – Connect your Xperia J ST26i to the PC Companion, Check for the notification of Jelly Bean 11.2.A.0.31 firmware as shown below. If you don’t have PC companion installed, download it from given below link. 2 – Click on “update” button to start the procedure. 3 – Check your present firmware and the updated firmware details. You Xperia J ST26i must be on Android 4.1.2 Jelly Bean 11.2.A.0.21 firmware and the new updated version should be Jelly Bean 11.2.A.0.31 firmware. If it is OK, click on “accept” button and proceed to update your phone. Check the screenshot below. 4 – Now PC Companion will prepare your system for the Jelly Bean 11.2.A.0.31 firmware update and as soon as system is prepared, the Jelly Bean 11.2.A.0.31 firmware update will be downloaded and the new updates will be applied on your phone. Check screenshot below. 6 – As soon as update is downloaded and applied on your phone, you will see written “finish” . Disconnect your phone from PC. NOTE :- The first reboot after the Jelly Bean 11.2.A.0.31 firmware update will be slow, it will be normal soon. Now as the Jelly Bean 11.2.A.0.31 firmware update can be region dependent, so if you haven’t got it yet, please try updating your Xperia J ST26i Jelly Bean 11.2.A.0.31 firmware via Sony Update Service. Let’s see how to do that. 1 – Download the Sony Update Service program on your PC from given below links, if you haven’t got it. 2 – Switch off your phone. Wait for 30 seconds. Now holding volume down button, connect your phone to PC and let SUS detect you phone. Check screenshot below. 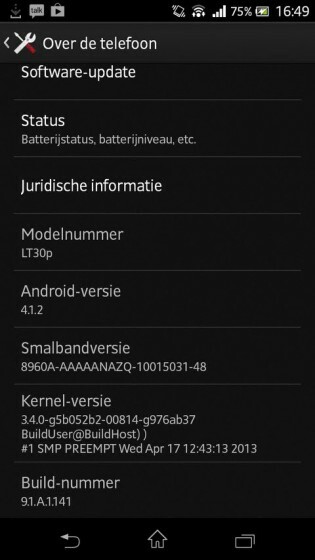 3 – Now as soon as your Xperia J ST26i is connected you will see the update notification to Jelly Bean 11.2.A.0.31 firmware as shown below. Click on “software update (recommended)” option and “install” button. 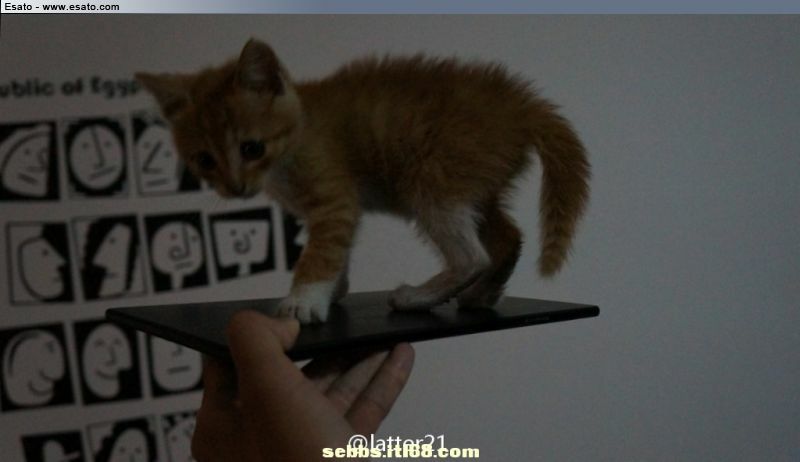 4 – Now SUS will start downloading Jelly Bean 11.2.A.0.31 firmware which is of 395.7 MB size. Wait for a while and as soon as downloading is finished, you will see the notification of completion. Disconnect your phone. I hope now you are successfully able to update your phone via any of the two methods available above. If you still find any problem is updating you can also manually Manually update your Xperia J ST26i by Flashing Jelly Bean 11.2.A.0.31 firmware ST26i_11.2.A.0.31.ftf file. Let’s see how to do? Download the Jelly Bean 11.2.A.0.31 firmware ST26i_11.2.A.0.31.ftf file from given below links. 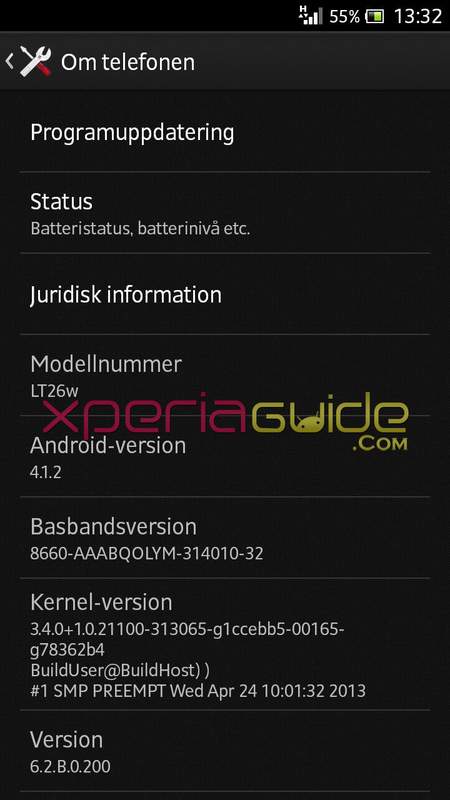 Unlocked bootloaded on Xperia J ST26i. If you want to unlock bootloaded, please refer to official steps from Sony. Jelly Bean 11.2.A.0.31 firmware ST26i_11.2.A.0.31.ftf file downloaded from above link. 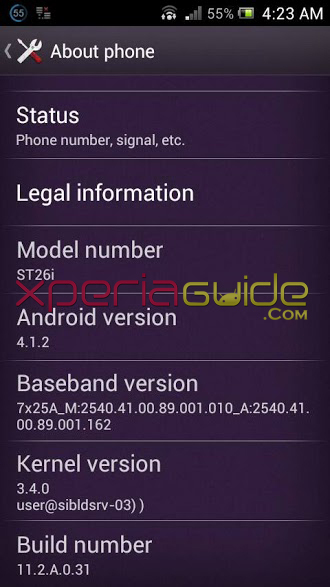 How to flash Jelly Bean 11.2.A.0.31 firmware ftf file manually on Xperia J ST26i ? Full installation guide has been posted below, Download the file from above links, please refer to steps in given below tutorial. 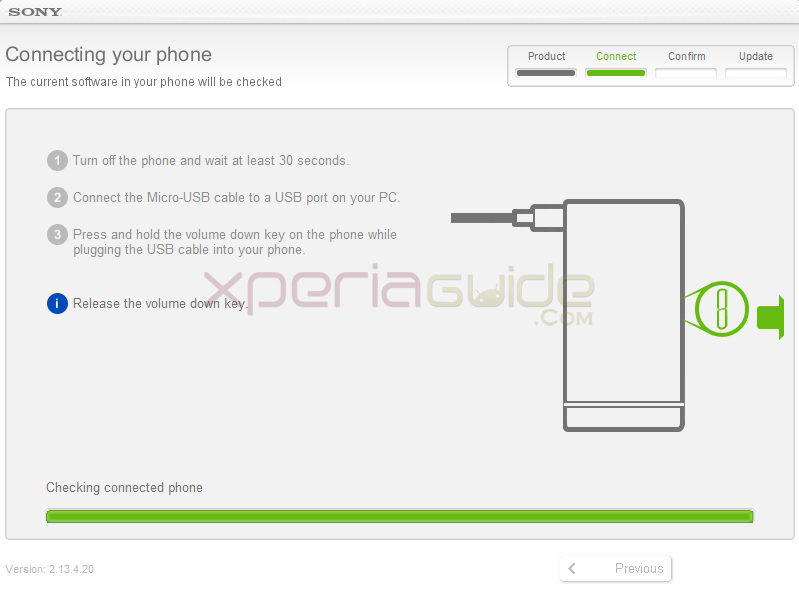 GUIDE : – How to Update manually Xperia phone by flashing ftf file via Xperia Flash Tool ? Another bazooka from Sony came over Xperia S user 😛 Sony Xperia Brazil blogs that android 4.1.2 Jelly Bean update for Xperia S LT26i coming in the first half of June. 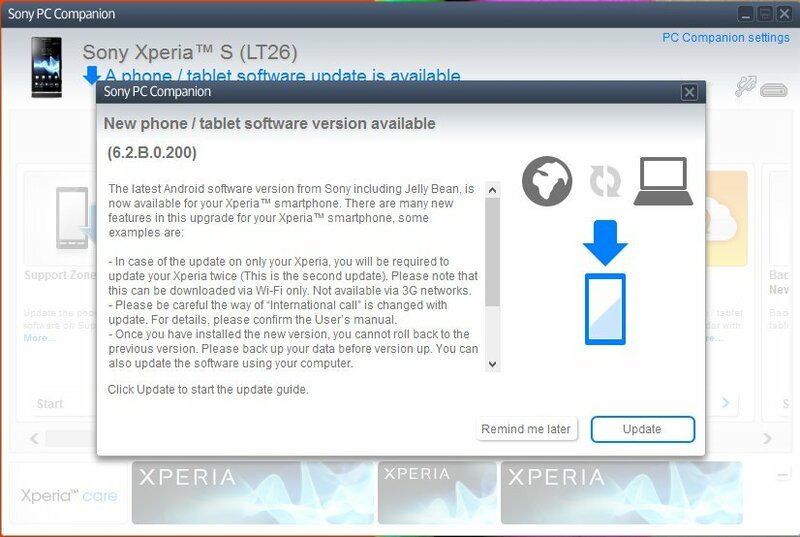 It’s a contradictory statement from Sony now, as yesterday Sony Xperia France tweeted yesterday that Android 4.1.2 Jelly Bean update for Xperia S LT26i is rolling out and the final build be ready till the last week of month of May. Yesterday we posted a news regarding PTCRB listing another Android 4.1.2 Jelly Bean update firmware build number 11.2.A.0.31 for Xperia J ST26i and now Sony Xperia Brazil says that android 4.1.2 Jelly Bean update will be coming for all phones Xperia S, P, J and E dual. 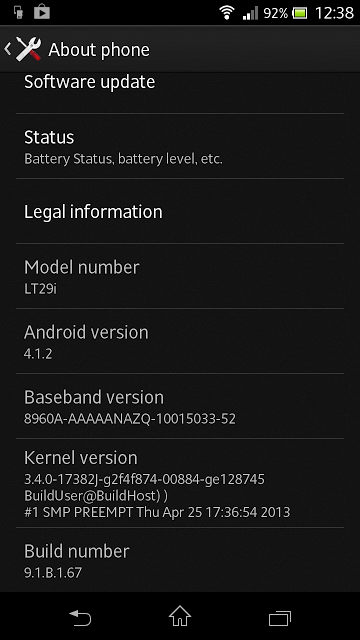 As Xperia J, P have already got android 4.1.2 Jelly Bean update globally so now it can be a new firmware build number for it. They have also said about android 4.1.2 Jelly Bean update for Xperia E Dual, that it is being tested and is guaranteed that it will come soon may be in first half of June. Xeria J ST26i Android 4.1.2 Jelly Bean 11.2.A.0.31 firmware OFFICIALLY Rolled out, TO install check given below link. No new media apps, no new homescreen, no new apps were seen, it was just a Jelly Bean update for the name sake. So it’s again their turn now with a new build number. PTCRB has listed a new Xperia J ST26i Android 4.1.2 Jelly Bean 11.2.A.0.31 firmware on their site on 17 May. Well as it seems to be Jelly Bean update with some bugs fixing like Wi-Fi not connecting error, more battery drain, lagging of phone etc. Sony has officially put the Open source archive for build 11.2.A.0.31 on their developer site for download, if you want to download it you can from given below link. It is news of relief for all Xperia J users out there. If you have got this update notification do let us know, till no users in any region have reported this update. It will not take a mot time till we see Jelly Bean 11.2.A.0.31 firmware actually getting rolled out for Xperia J ST26i users. It may happen Sony add some new media apps in this new Jelly Bean 11.2.A.0.31 firmware update with all the latsest features which all Xperia phones got with Android 4.1.2 Jelly Bean Update. A lot good news for Xperia users today, back today Sony Xperia France tweeted that Android 4.1.2 Jelly Bean for Xperia S is rolling out and will be available till next week 🙂 Till now no further dates have been mentioned, it seems it will come at the end of month May. 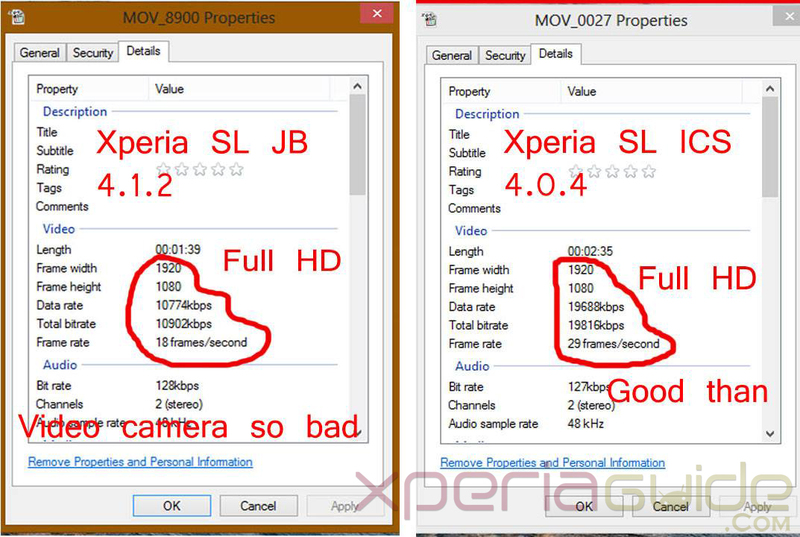 Good news for all Xperia S owners. Well it looks like Sony Xperia S LT26i Android 4.1.2 Jelly Bean is rolling out just now Sony Xperia France has tweeted it. 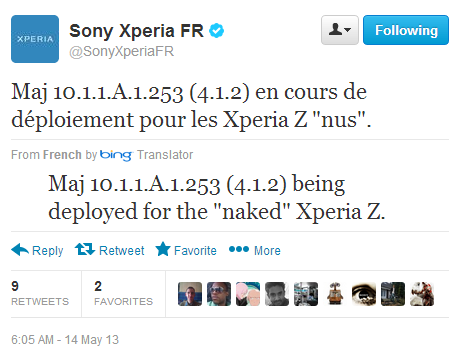 As official Sony Xperia France has tweeted this it means jelly bean update is about to roll just. Update deployment is going on now for the first day will be updated next week fully. What does this all signify, has update rolled out or is in final development stage. By looking at their tweet it seems the update has been rolled out but we didn’t see any update notification on our Xperia SL LT26ii neither in PC Companion nor in SUS. Check below screenshot. It looks that update is either rolled out in some countries or will be rolling out next week. We don’t see any update notification in India. 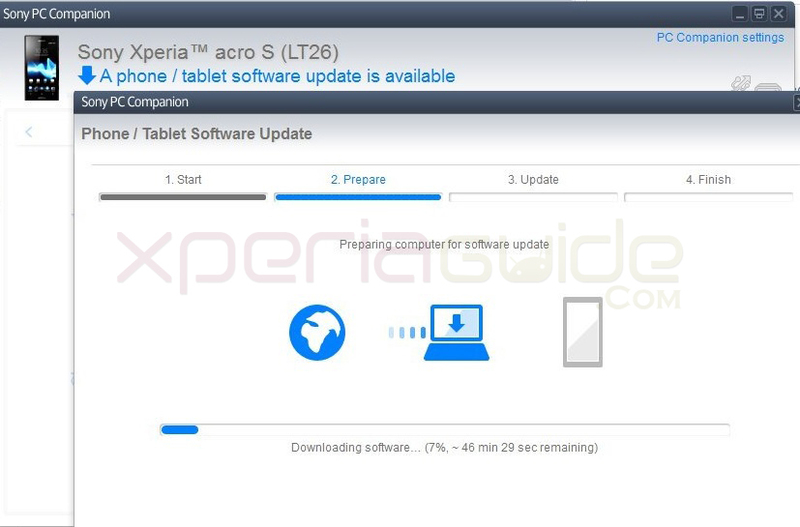 Do let us know if you have got the update in your country or on your phone Xperia S LT26i or SL LT26ii or Acro S LT26w. 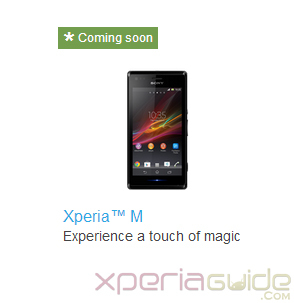 What do you think is Sony trolling all Xperia S owners again or will update it at the end of month May. 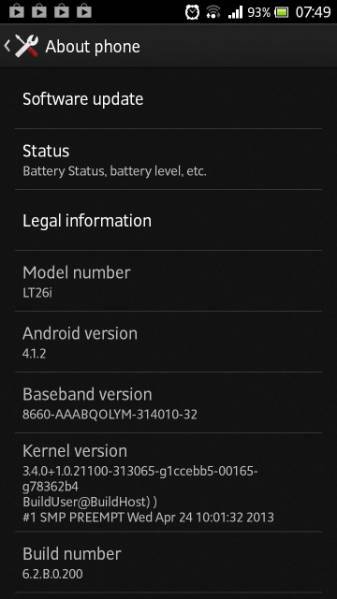 [ UPDATE – 25 MAY 2013 ] To download and install LEAKED Android 4.1.2 Jelly Bean 6.2.B.0.200 firmware follow given below link. Xperia Tablet Z is about to release globally and a good news has come for it from the CynaogenMod community, yes they just announce on their Google+ page for adding CyanogenMod10.1 Android 4.2.2 support for Xperia Z Tablet. A few days we came across news regarding Sony adding Xperia Z to AOSP on GitHub. Good news for all users who are about to buy Xperia Tablet Z and don’t like stock Sony ROM, now you can install this fancy ROM on your Xperia Tablet Z. CynaogenMod has been one step ahead from Sony. Check below running live CyanogenMod10.1 Android 4.2.2 on Xperia Tablet Z. Both Xperia Z and Tablet Z runs the same chipset so it’s very easy for developers to build for it also. Release Build is fare more stable. 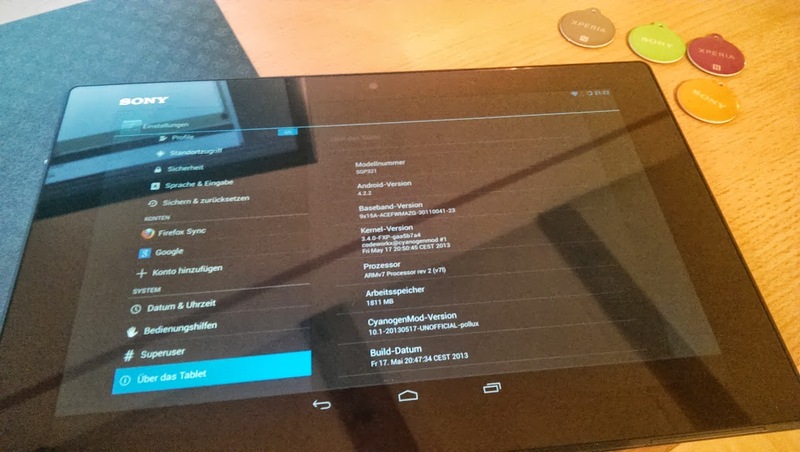 Download CyanogenMod10.1 Android 4.2.2 for Xperia Tablet Z – Install / Flash it. CynaogenMod community has added both the release candidate build (RC) for Xperia Tablet Z as well as the test build of android 4.2.2 which you can download from their site and flash it on your device. Download the files from below or from their official site. Xperia Guide, the new venture from Anurag and Ashish after sucessfully creating “Android Gyan” back in July 2011. The last giveaway we organised was of Xperia J on our previous blog Android Gyan, now we have come up with something more grand and exciting. Blog posting on Xperia Guide has been recently started in the month of May only and has got a great response till now from Xperia fans. To spread out our goodwill, we are giving a brand new Sony Xperia SP in a giveaway, with many more prizes in total a worth of whooping $650 to be won as free. 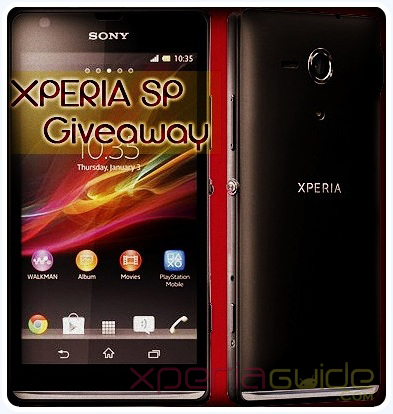 Xperia SP C5302 Giveaway – Win Prizes worth $650 Free. 1 SEO Pressor V5 Multi-site plugin. 3 WpShit (Uxde) themes VIP 1 year License. 2 Samsung Galaxy S4 Flip Case cover (Black Mist color). Contest is open worldwide, yes an international Xperia SP C5302 giveaway. For INDIAN users, Xperia SP will be couriered to their address, while for foreign country participants, the phone will be shipped after ordering from either Ebay or Amazon. Giveaway starts at 20th May 2013 at 12 pm till 3 July 2013 till 12 pm. i.e. for a period of 45 days. So you have more than a month to earn as many entries as you can 🙂 Giveaway winners will be chosen within 2 days after giveaway is finished. Enter in the giveaway by given below embedded PunchTab form. Please provide your real name and email address as it will be used to contact winners. MANDATORY Step – Please comment below, stating that you have completed all steps for the giveaway, as we have added an additional step in the giveaway which is excluded from the main entries so we need to know which person have done that step in comments only. To be eligible for the lucky random draw every participant must complete all steps of giveaway otherwise their entry will be disqualified without any notice to them. Giveaway Grand Prize winner and other prizes winner will be chosen by a random draw, yes it’s a lucky draw. As per instructions of Xperia Guide Team, it may happen that Grand Prize winner will be chosen randomly from the “top 30” individuals having more number of entries and for rest other prizes, it will be purely a lucky draw. As giveaway proceeds we may add some more prizes to the giveaway. Xperia Guide Team admins hold every possible right to cancel the giveaway at any moment without any prior notice to the participants of the giveaway. Winners will be chosen randomly as mentioned above via PunchTab random winner selection tool, and the winner selection process may or may not be shown to the participants. No request regarding that will be entertained. Decision of Xperia Guide team in choosing the winner will be final and it can’t be challenged in any case. Xperia SP C5302 giveaway is sponsored by us i.e. gizmobolt.com and some undisclosed sponsor Giveaway is not at all sponsored by Sony Mobile Communications or WpShit Themes, Samsung or by SEO Pressor Team in any manner. No claims regarding that please. Do not spam, participate only once, multiple entries by the same user are liable to be dis-qualified. 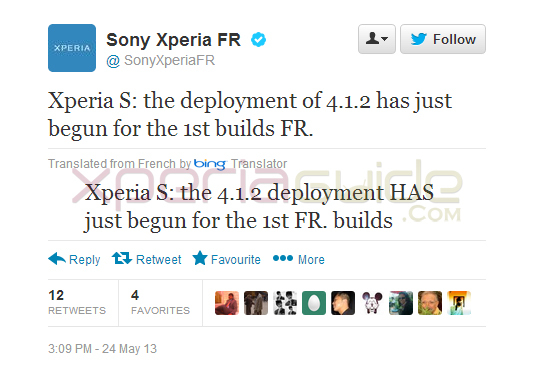 Sony Xperia France has just tweeted about a new Jelly Bean Android 4.1.2 10.1.1.A.1.253 firmware which is rolling out on Xperia Z handsets. Looks like Xperia Z is lucky to have so many firmware updates yet on Jelly Bean alone for better performance. The update still puts Xperia Z on android 4.1.2 jelly bean. Previously it was on 10.1.1.A.434 firmware build number. Maj 10.1.1.A.1.253 (4.1.2) en cours de deploiement pour les Xperia Z “nus”. TRANSLATED as Maj 10.1.1.A.1.253 (4.1.2) being deployed for the “naked” Xperia Z.
Update of Xperia Z C6603 on Jelly Bean 10.1.1.A.1.253 firmware has been confirmed in countries like India, Philippines, Indonesia for C6602, Vietnam, Malasiya, Thailand, France, Singapore. Much better soft keys now and notification bar and soft keys both changed to black color background area. The STRIP behind soft keys has been colored as BLACK previously it was of GREY color. 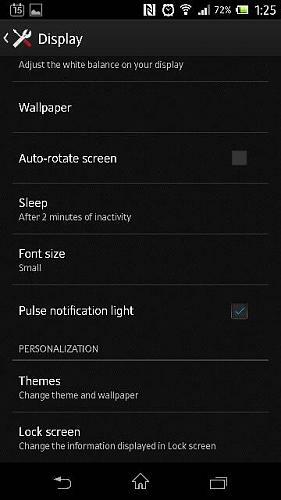 Now notification light can be turned off. Xperia Launcher is responding much faster than before. Small apps icon have been changed now. You can now tag in photos, new option added in album. View movies in portrait mode now. No Wi-Fi drops any more. Issues rectified. 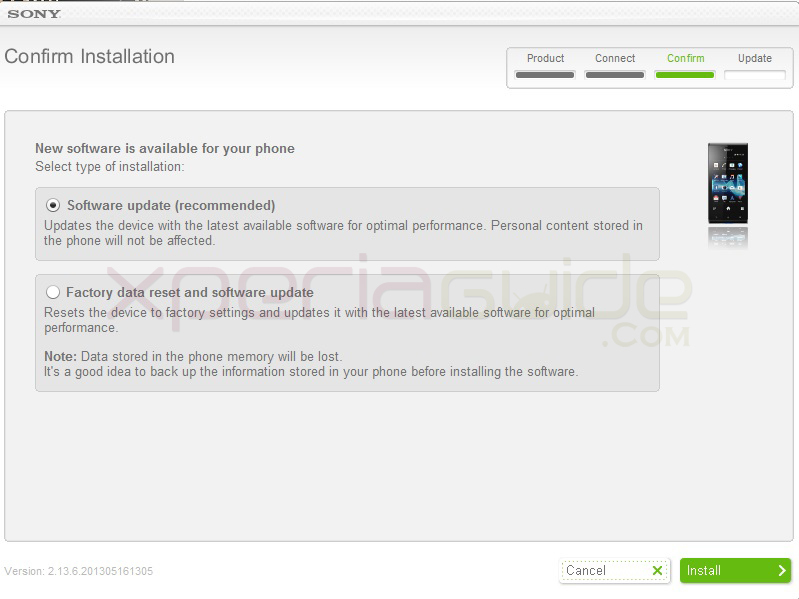 How to Update Xperia Z C6603 on Jelly Bean 10.1.1.A.1.253 firmware by PC Companion ? 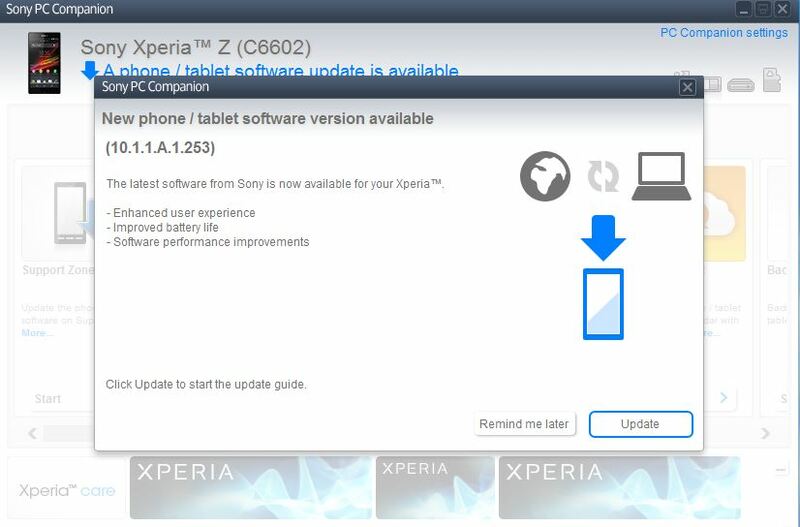 Connect your Xperia Z C6603 to PC via PC Companion, check if you have got the notification for 10.1.1.A.253 firmware update, if yes proceed as per screen instruction. How to Update Xperia Z C6603 on Jelly Bean 10.1.1.A.1.253 firmware by flashing ftf file? First of all download your region’s firmware ftf file from given below links. Flash the above file on your unlocked bootloader Xperia Z C6603 and enjoy the new 10.1.1.A.1.253 firmware 🙂 Check below link how to flash. If any one wants Xperia Z blob files, Download blob files from given below link. 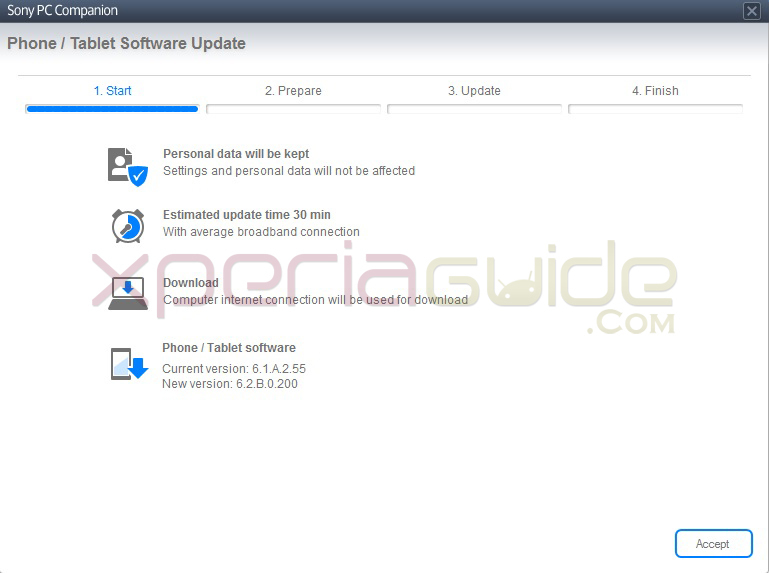 How to Update Xperia Z C6602 on Jelly Bean 10.1.1.A.1.253 firmware by PC Companion ? Connect your Xperia Z to PC via PC Companion, check if you have got the notification for 10.1.1.A.253 firmware update, if yes proceed as per screen instruction. 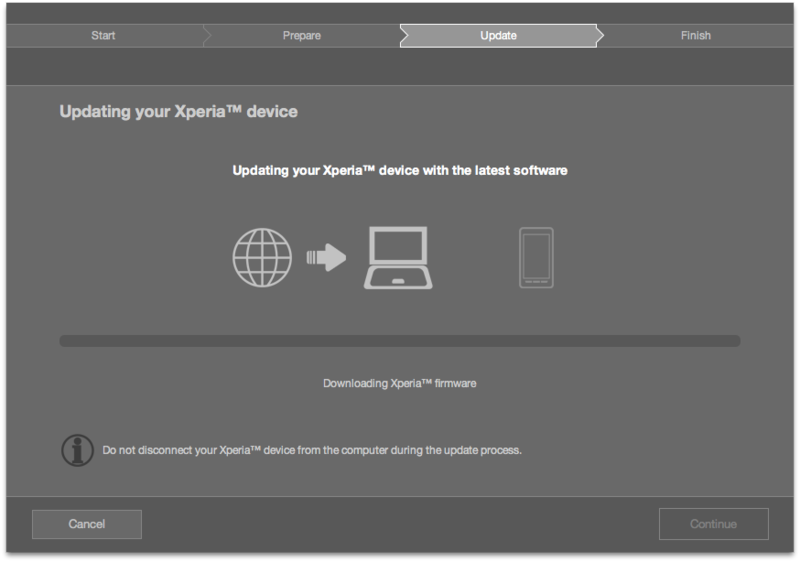 For those who are not able to update it via PC Companion, update Xperia Z via Sony update service, check how to update via SUS. It’s good that Sony has updated Xperia Z to a newer firmware version fixing some serious issues and updating new features. Well if you need any help in flashing or updating your Xperia Z C6603 on Jelly Bean 10.1.1.A.1.253 firmware, do let us know we will help you out in comments. Well if you have already updated to this new firmware version then do let us know what more changes you noticed in the updated 10.1.1.A.1.253 firmware. Do let us know if find anything else updated in this firmware. 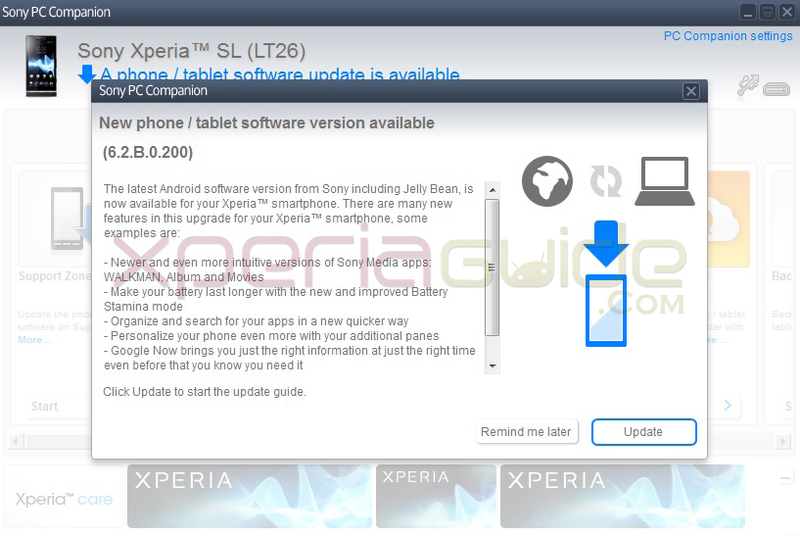 It looks like Sony developers are now testing android 4.1.2 Jelly Bean firmware for the devices Xperia S, SL, Acro S and Xperia Ion. Last week we reported about DooMLorD’s leaked Android 4.1.2 Jelly Bean firmware 6.2.B.0.197 forXperia S / SL and then after that we saw on PTCRB site, official listing of Xperia S/SL/Acro S android 4.1.2 Jelly Bean 6.2.B.0.200 firmware certification. Now there was only left Xperia Ion LT28i. 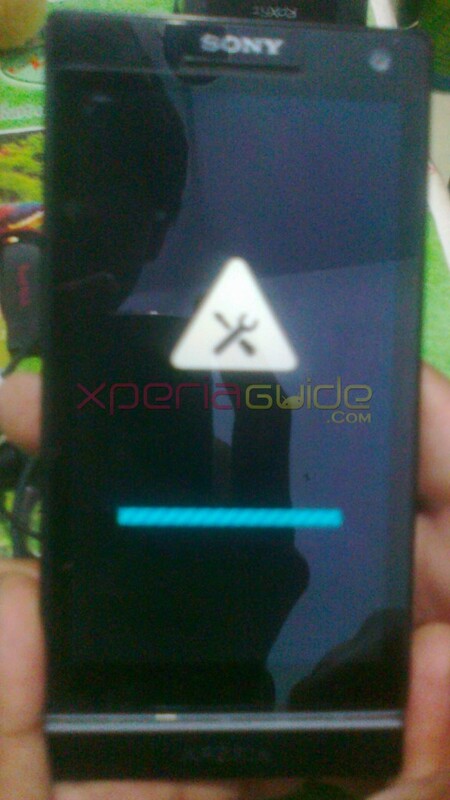 Just now we saw leaked Xperia Ion LT28i Android 4.1.2 Jelly Bean 6.2.B.0.203 firmware. We saw the same 681 MB RAM, new notification window, Mobile Bravia Engine 1, Clear Phase feature in New WALKMAN app, new kernel version. 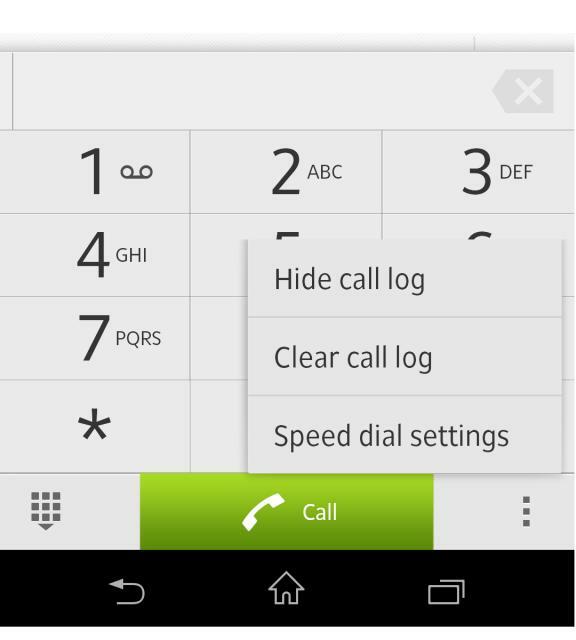 How to Flash leaked Jelly Bean 6.2.B.0.203 firmware on Xperia Ion LT28i ? Jelly Bean 6.2.B.0.203 firmware ftf file for flashing is only for development devices. Do not flash it on your user device (RED). Now if you are thinking of flashing this firmware on your Xperia Ion, wait please, as the leaked firmware 6.2.B.0.203 by DooMLoRD is in development phase till now, the ftf file for flashing jelly bean fimrware 6.2.B.0.203 will be uploaded soon. 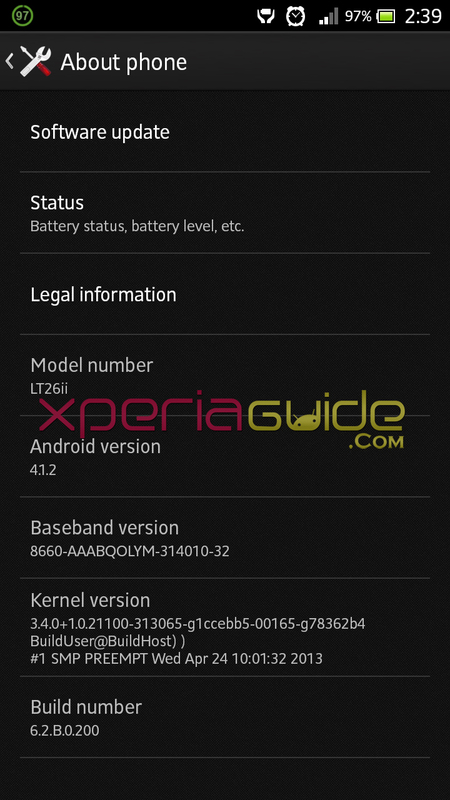 [ UPDATE ] Kernel for leaked Xperia Ion LT28i jelly bean fimrware 6.2.B.0.203 you can download from given below link. How to flash jelly bean fimrware 6.2.B.0.203 on Xperia Ion ? Download the kernel file from above link. Bootloader on your Xperia Ion LT28i must be unlocked. You can follow the official guide to unlock bootloader here. You must flash now stock ICS ROM. Flash JB .zip fw via cwm. Now flash the downloaded kernel, and reboot your device. Check the photos of jelly bean fimrware 6.2.B.0.203 running successfully on developer Xperia Ion devices. 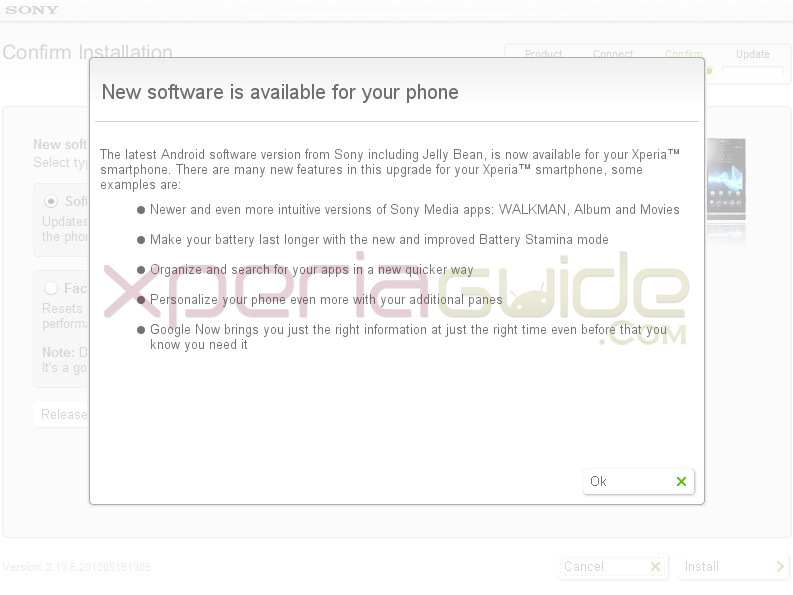 Till now there is speculation on XDA forum that will this ROM work on both Xperia Ion LT28i and LT28h. It seems it should work. Do check the source of this leak below this post more development issues regarding Xperia Ion Jelly Bean and if you face any issues you can report here and there also. 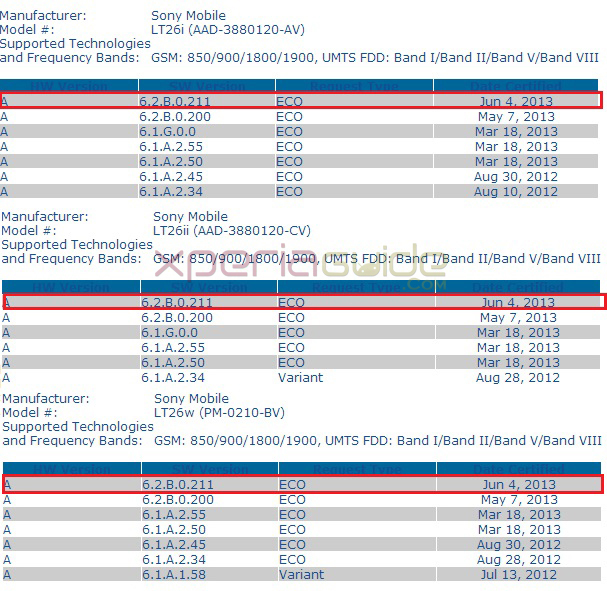 As we have now seen for all Xperia S, SL, Acro S and Ion jelly bean firmware leaks we may soon see Sony releasing official jelly bean firmware for all these 4 handsets. We will keep you posted as more details about official jelly bean comes out. 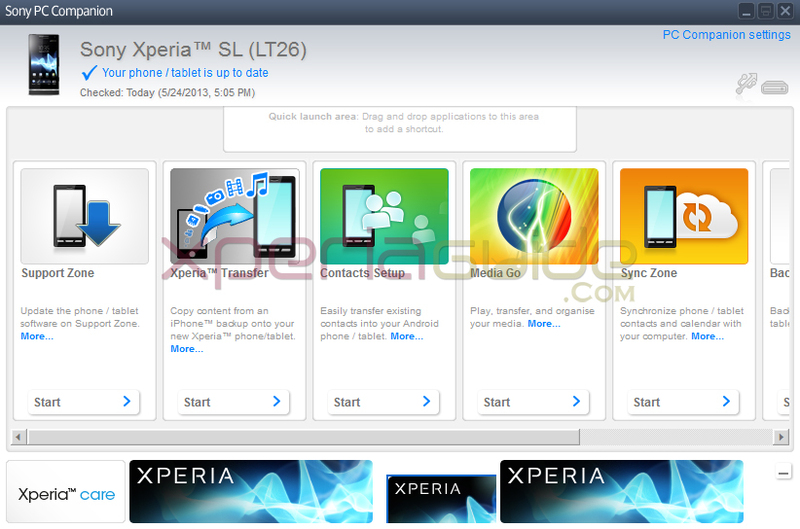 If you need any file for flashing the above firmware on your Xperia Ion LT28i, do let us kno win comments section we will upload it and get you the link.